The headlines were a bit different Tuesday morning. Which meant that Monday night was different and much worse than the two nights before. 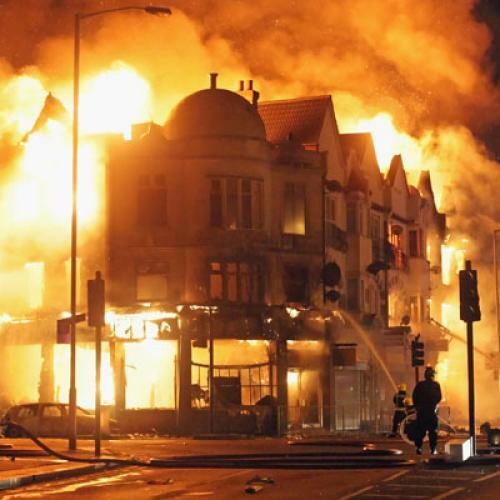 The Telegraph led with the headline “Rule of the mob.” The Times, in the same vein: “Mobs Rule As Police Surrender Streets.” The Independent told us that it is “Mob rule: Police and politicians powerless as London burns for a third night and riots spread.” The grimmest was in the very left-wing, often dishonest, Guardian: “The battle for London: Full-scale alert as violent riots spread across capital. Mayor and home secretary return, PM still on holiday.” Oh, yes another, more threatening: “Disorder breaks out in Birmingham city centre.” So the question is: How far will the brigandage spread? And how brutal will it become? Frankly, I had thought for a moment the victims and the perpetrators of the Tottenham depravity were mostly immigrants. But I learned something about the Islamic world of London. It is a community in the very real sense. You can see it along Edgeware Road, all the way up to Marble Arch and Speaker’s Corner, and even in some outer boroughs of the city. The integration of Muslims into the metropolis is no better symbolized than in the peaceful proximity of the Lord’s Cricket Club (which claims to be where the sport originated), the residential estate of the American ambassador, and the enormous London Central Mosque. There is no incitement here, as opposed to the smaller and largely Pakistani religious establishments scattered elsewhere in the city but concentrated in Leeds, Manchester, and Birmingham, industrial cities on their ways down, down, down. And, yes, there are occasional “hate Israel” fests also. The victims and the perpetrators of the Tottenham depravity are largely black. But they are mostly victims. Given the phobia against faces they are truly faceless. They have been left behind, and were left behind when London was alight with Asian gold and Arab gold and Russian gold, including the gold of the Russian Jewish oligarchs. When London is prosperous it is the underlay of prosperity of the super-wealthy who do not wish to live at home. Or stay at home for long. So the local blacks and immigrant blacks (and their children) bear every burden of being ignored or not seen, which may be the only interaction they have with whites. The remaining pluck of black society in Tottenham and in the other Tottenhams in the country is pluck beyond all misfortune. But this is not what this is about. What used to be prosperous Europe is now in danger because it is trying to rescue the economies of financially frivolous Europe: Greece, Portugal, Spain, Ireland, Italy. In the meantime, citizens of England are without work. And Europeans from the east have taken their jobs which I’m not sure they wanted in any case. THIS IS ABOUT the president. Early Friday afternoon, I was sitting at my desk, actually daydreaming. My garden, variously green with yellow, blue, and red flowers, was in full bloom. I did not want this call—or any call, for that matter. But the woman on the other end sounded both pleasant and literate, a rarity these days when you answer the telephone and the caller mispronounces your name. Well, this caller didn’t. Still, she did say that she was phoning from “Obama for America.” Or was it “America for Obama?” I assume this means that she wasn’t phoning me from India. No matter. Maybe she heard in my hesitant silence that I was not about to give. In any case, she said quickly, “I’m not collecting money. I’m collecting reflections.” She was also funny. My reflections weren’t especially reflective—or logically sequential. But I did have things to say. My first thought was that Obama hadn’t even tried to craft a communal feeling around the troubles that almost everyone has been having about the ever more depressed economy. Even optimists have that feeling, and also the quite well-to-do. And, frankly, “the quite well-to-do” are part of the middle class. Then, I said, I didn’t especially appreciate Michelle saying long ago, after some primary victory of her husband, that this was the first time she was proud to be an American. This is not exactly a credential for First Lady. But she wasn’t the candidate. Still, I’m sure she was proud when she wrapped her body and neck with sleek and expensive dresses plus garish jewelry, the kind we used to smirk at when Mrs. Reagan wore them. Oh, I also didn’t like his foreign policy which, translated into plain English, amounted to the president saying again and again that the country had no real foreign interests or concerns. Yes, I said, I was Jewish. Yet his stupid Israel policy was only the beginning of my own discomfort with his greater comfort with Arab dictators than with elected leaders of democratic societies. What’s more, he had dissed Europe ... and so on ... and on. I suppose that you might say that I wasn’t exactly coherent. And depressed she should be. And I am. As you also ought to be. This, incidentally, was before S & P downgraded America’s credit rating. Which I also thought a bit grotesque since it was S & P which, along with Moody’s and Fitch, were the credit rating agencies that had relentlessly and insidiously maintained the triple A grade for the most retrograde banks and other financial institutions that were the catalysts of the financial collapse and, lo and behold, also profiteers from it. (I never trusted these ratings, which is why I shorted the stocks to which they were given.) In court, by the way, S & P claimed “freedom of the press” protection for its wrong-doing. 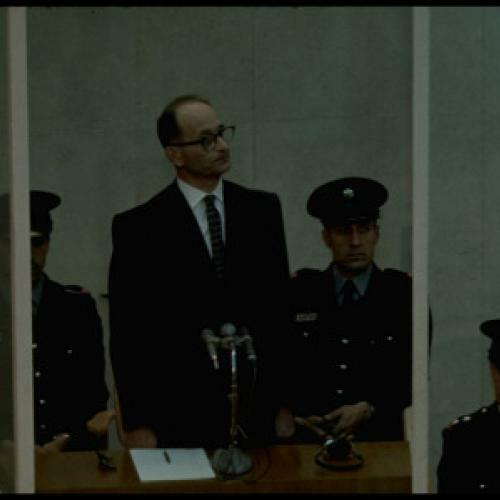 CAGES: DO YOU REMEMBER Adolf Eichmann? I was reminded of him when I saw a photograph of Hosni Mubarak. At his trial. In a cage. With his sons. Also caged. Frankly, I don’t expect much of Egypt when it has arrested someone. In fact, I don’t expect much of Egypt in general. You were hopeful at the beginning of Arab Spring? I was too. Soon it will be Arab Winter. This is a truism for the people of this tortured land. But, after all, protestors in Tahrir Square said they wanted to clean up the justice system. Incarcerating the deposed president—sick, no less, and bound to be convicted—in a heavily wired cage at the front of the courtroom does not augur well ... and it certainly doesn’t augur anything remotely fair. He is in this cruel and ugly confinement because the court and the mob want revenge, as I assume Mubarak also wanted revenge on others. In fact, Mubarak had also put the killers of Anwar Sadat in a cage. This did not protect their dignity, such as it was. And now I want to make a comparison to the trial by the State of Israel of Adolf Eichmann, the chief engineer of the final solution. You can read about it in many places including—if you forgive me—a short but fair summation on Wikipedia. You can also judge whether it was fair. But Eichmann was also put in a cage. A glass cage. That’s the important difference. It was built to protect the defendant from some outraged observer sitting in the courtroom who may have wanted to shoot him. And, presumably, there were plenty who would aspire to finish him off. Guards were in the cage with him. Compare the two cages. Yes, his cage was to protect him. Some people say that Eichmann could never have had justice, especially in the Jewish state. Maybe. But, then, what kind of state would acquit him? It would be the new Iran which is the worst Persia there’s ever been. AND ANOTHER COMPARISON. This comparison is from two Saudi columnists. One is Khalaf Al-Harbi, writing in the official—which makes his article quite important—’Okaz. (You’ve already met him in my last Journal entry.) The second is Fawaz Al-’Ilmi in the very popular Saudi daily, Al-Watan.And both of these little essays perhaps show that Arabs are beginning to realize that Israel is not an ephemeral presence in the Middle East. Amidst the mayhem stretching from the Maghreb to Syria and beyond, the peaceful and thoughtful demonstrations for real economic and social reform reveal a mature democracy. 300,000 people marched yesterday. And d’ya know what? It was probably the greatest tonic to Zionism in decades. “When we were young, the teachers exhausted us by reiterating that Israel is, without question, a temporary and transient country. When we got old enough to read, newspapers and books filled our heads with reasons why Israel could not [continue to] exist in its Arab surroundings. For years, we waited for the moment when Israel would disappear, and here we are [today, witnessing] the moment when the Arab countries are beginning to topple, one after the other. “A few days ago was the 44th anniversary of the naksa [i.e., the defeat in the 1967 war], when Israel swallowed up Arab lands... A week or more ago, [Israeli Prime Minister Binyamin] Netanyahu delivered a brilliant speech before the American Congress in which he emphasized that Israel would not return to the 1967 borders. This statement means that Israel has achieved such a degree of complacency and tranquility that it is no longer willing to negotiate even over those lands it has admitted to occupying [in 1967], much less... over the lands it occupied in 1948. Do we really still believe that Israel is a temporary entity bound to disappear? “The secret to Israel’s survival, despite all the great challenges it has faced, lies in democracy and respect for the worth of the [Israeli] individual, regardless of [Israel’s] racism and brutality vis-à-vis its Arab enemies. The secret to the collapse of the Arab countries, one after another, lies in dictatorship and in the oppression of the individual... It is impossible for an Arab country, a neighbor of Israel, to succeed in liberating Palestine while denying dignity to individuals [within its own borders]. “Israel won war after war, and scooped up Arab lands larger than [Israel itself] in both size and population. It then went on [to develop] manufacturing, industry, and invention. The [average] income there is double [the average income] in the neighboring Arab countries. [Israel] has rendered itself an inescapable fact. Throughout all stages [of its development], it drew its power from the honor it granted to its citizens, while its Arab neighbors trampled the [poor] creatures known as their citizens under military boots. “Tawasul is the official website of the Israeli Foreign Ministry, and, unlike Arab websites, it updates its entries every 12 minutes around the clock and offers them in Arabic, Hebrew, Farsi, English, French, and Russian. On January 20, the website published a report which revealed that the only registry in the world for Arab bone marrow donors is located in the Hadassah Medical Center, associated with the Hebrew University in Jerusalem. It should be noted that the Arabs living in Israel constitute no more than 1.2 million of the world’s Arabs, who number upwards of 400 million. “The report, prepared by Avigayil Kadesh, notes that Dr. Amal Bishara, who oversees organ donations at the Hadassah Medical Center—an Arab woman with a doctorate in life sciences and immunology—has single-mindedly visited more than 60 Arab villages and cities since the bone marrow registry was founded in 2008. [She did so] to further her own research and to supplement the Jewish registry, which has been active at the hospital for 22 years. Through lectures and social networking, the Arab doctor added 9,000 [Arab] donors, thereby enabling six [transplants] of donated bone marrow... It should be noted that 60% of Arabs [in need of such transplants] find donors within their families, and 90% of the requests for bone marrow transplants are for Arab children suffering from hereditary diseases due to consanguineous marriages. “Before these Arab [donors] were registered, the Hadassah Medical Center largely failed to expand its donor registry, or to [arrange] donations from Jew to Arab or vice versa. But, thanks to the Arab doctor, perceptions have changed, and Arabs and Jews are willing to donate bone marrow [to one another] in order to save the life of someone they don’t even know. “This year, Israel published numerous scientific studies that put it in first place worldwide in terms of the number of studies [published] per capita—12 studies to every 10,000 people. America is in second place, with 10 studies [to every 10,000 people], followed by Britain, with nine. As for the Arab countries, they are all at the bottom end of these statistics. “For ten years now, Israel has been forming strategic ties with scientifically advanced countries in order to merge [its research] with their research centers, and in order to encourage its scientists to take part in international development programs. Today, there are 21 international science companies in Israel... It knows before everyone else the results of [these companies’] studies, reaping their fruits and using their scientific expertise to advance Israeli inventions. “The Israeli strategy in science and technology is based on finding new approaches in scientific research and technological invention by training new generations of scientists—especially in physics, chemistry, and the natural and social sciences, as [Israel] is convinced that these sciences will allow it to control the world and direct its course. EVEN THE SAUDI MONARCH has denounced and renounced Syria. I admit that this is a bit of an obsession of mine. But the Syrian death toll has risen to more than 2,000 dead. Even Saudi King Abdullah cannot tolerate the bloodshed. (And, of course, it is true that the prime benefit for Riyadh would be disgorging Bashar Assad from the presidential palace and the substitution in Damascus of Sunni power after an uninterrupted four decades of the Alawite monopoly.) Still, President Obama was entranced by Assad, and so was Hillary Clinton, and so also, I am afraid, was my friend Senator Kerry who, despite his diplomatic demeanor, is not a pushover for tyrants and murderers. We are entitled to an explanation. It won’t come from the establishment press. After all, The New York Times and other mainstream media outlets also deeply believed in Assad’s peaceful intentions vis a vis Israel. So it is left to the Senate Foreign Relations Committee. Let it muster the many experts who pushed this line as obvious. And the lesser number—but wiser—who didn’t.